Anything but typical, the Hampton Inn & Suites of Okemos provides the luxury of a full-service hotel - in a comfortable setting. With our 100% Hampton Guarantee and our Lighthouse Award-Winning Service, the Hampton Inn & Suites provides a unique experience for your visits to the Greater Lansing Area. Take one step into our beautiful lobby and you will immediately notice that this is not just any Hampton property. Instead, prepare yourself to be blown away We invite you to kick back beside our indoor heated swimming pool and whirlpool. Or if you would like, you can work out at your convenience in our 24-hour fitness facility. Better yet, return home looking like you were in Florida after making a few trips to our in-house tanning bed If that wasn't enough, enjoy our recently upgraded complimentary breakfast as you wake up in the morning - before hopping on our high-speed wireless internet to finish your last-minute business details. 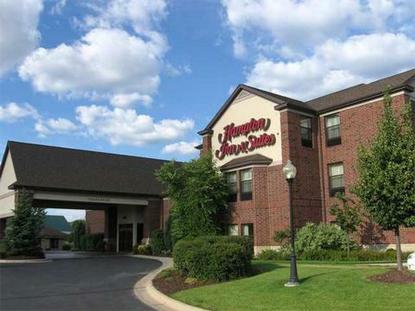 All this is yours just for staying on one of our stunning guestrooms or incredible suites The Hampton Inn & Suites opened in the summer of 2002 and is conveniently located off of I-96 and just minutes from Downtown Lansing or East Lansing. We are perfectly located near such attractions as Michigan State University, The State Capitol, The Impression 5 Science Center, The Meridian Mall, The New Eastwood Towne Center Shopping Center, The Wharton Center, and numerous Mid-Michigan Golf Courses In addition, we are within a block of several national restaurants. Our commitment is the utmost in service for you So go ahead and pamper yourself by making your reservations at the Hampton Inn & Suites of Okemos, Michigan. We are excited and ready to serve you and exceed your every expectation The Hampton Inn & Suites is also equipped with several meeting facilities, and all of the necessary amenities for today's business traveler. For information on meetings, corporate rates, and other needs, please contact Nick Miller directly at the hotel at 517.349.6100 Ext. 425 - he will be happy to assist you.